The morning began with a drive across southeastern Idaho on winding, two- lane roads. Almost no towns blocked the path as I crossed into Wyoming, driving more than 150 miles without stopping. The first stop of the day was at Fossil Butte N.M., a high bluff overlooking the path taken by US 30 and the Union Pacific, ten miles west of Kemmerer. Fifty million years ago this area was underwater; since then, geologic forces have pushed up the land to an altitude of 6,800' and successive deposits of sediment have fossilized thousands of creatures. The visitor center, a trailer-sized building at the foot of the butte (a new visitor center is supposed to open soon), exhibits a number of these fossils -- far more than were visible when I hiked two miles, round trip, to the butte. The walk wasn't too bad, actually -- good exercise (especially at the altitude), nice views, and some interesting rock formations at the top -- but I would've felt better about it if there had been actual fossils visible at the top. As I continued toward I-80, three out of every four signs by the side of the road advertised Little America, a complex along the interstate which included a huge (65-pump) gas station, a restaurant/coffee shop/gift shop, and a 150-room motel. The gift shop couldn't decide whether it wanted to carry "real" items or the trashy, Stuckey's stuff I go for, and wound up completely undistinguished despite the hype. Little America's mascot, a cutesy penguin, adorned all its signs; as soon as I was back on the highway, the barrage of signs began again for the OTHER Little America outlet, 300 miles down the road at Cheyenne. The folks at Wall Drug could learn from this marketing. The Interstate calmly and efficiently carried me across half the state, avoiding anything with local color. Only my advance planning alerted me that at the Continental Divide crossing just west of Creston, a small monument south of the road honored Henry Joy, a pioneer of the Lincoln Highway. Even at the exit, no signs alerted me to the monument, which lay about 50 yards off the Interstate along what had obviously been the old Lincoln Highway. 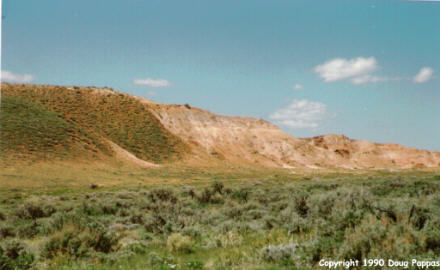 The pavement trailed off into gravel as I turned toward the monument; further down the old road, it was reduced to dirt. The contrast between the dirt Lincoln Highway and the stark, modern I-80 a few yards away made for a fine photo.